Most of you know that I’m a big fat nerd when it comes to deep-marine turbidity currents* and the sedimentary deposits they create – turbidites (e.g., here, here, here, and here). In fact, my current employer recruited and hired me because of my turbidite nerdiness. As a result, I spend a lot of my time investigating and examining various turbidite systems. Sometimes these systems are still active and on the modern sea-floor, sometimes they are buried deep in sedimentary basins, and sometimes they’ve been buried, subsequently uplifted and are now exposed in mountains. Last week I had the opportunity to go visit some outcrops in the Canadian Rockies of British Columbia. A Canadian researcher and his students have been working on these rocks for several years and were kind enough to show us around for a few days during their field season. For this post, I’m going to discuss very general aspects of the system and show some photographs. If you want to get into the real sedimentological nitty-gritty I’ve included citations for papers they’ve published at the bottom of the post. We flew into Calgary, Alberta and spent a good part of a day driving to the town of McBride, BC. You can do it in about 6 hours, but we stopped along the way to see some of the sites in this beautiful part of the world. 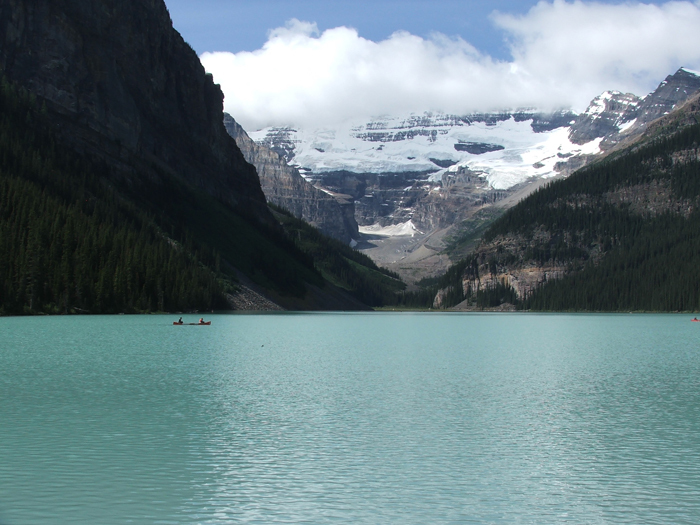 If you haven’t already been there, you’ve probably heard of and seen photographs of Lake Louise (above). It’s right off the road and there’s a huge hotel there so it’s a popular tourist spot. At the recommendation of the researcher studying the rocks we were going to see, we stopped at a railroad cut along the way (above) that is interpreted to be roughly time-equivalent to the rocks at the main field site. Looking at rocks along railroad cuts always reminds me of my undergrad days back in the eastern United States. We made it to McBride later that day and spent the night in a motel there. The next morning we made our way up to their campsite. 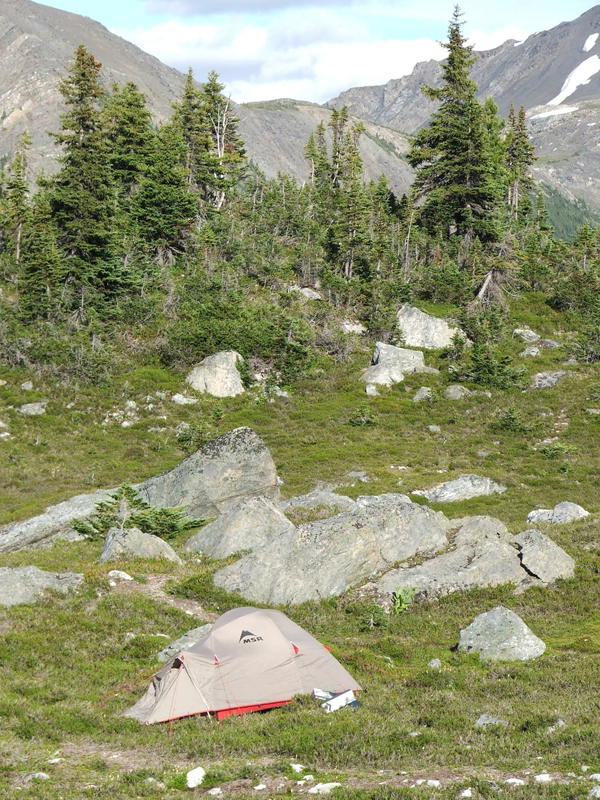 The photo above is my tent, which is still hangin’ in there after four field seasons in Patagonia weather. We were staying with a group of about 10 or so students who were living up there for seven weeks. The image above is a perspective image from GoogleEarth showing the unique set up for these strata. The rocks, which are latest Neoproterozoic (~600 million yrs old), are dipping vertically on the steep limb of an asymmetric anticline. 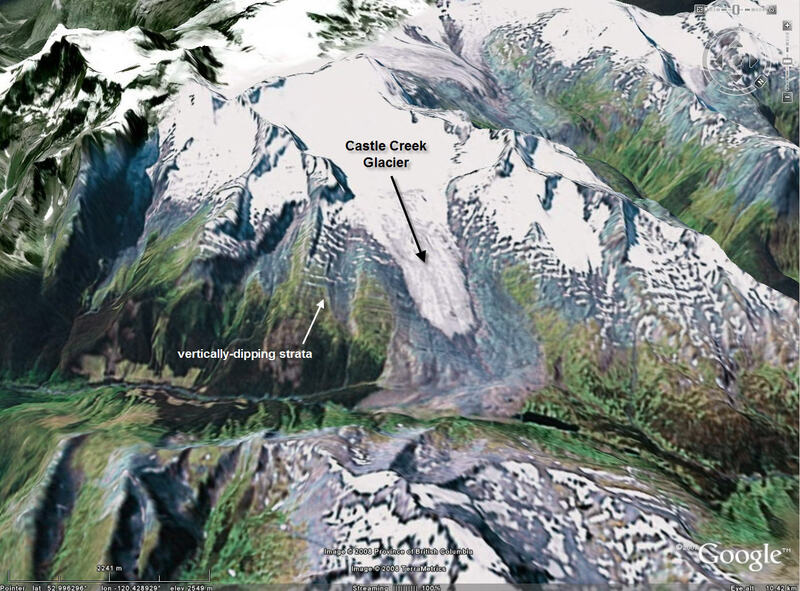 The Castle Creek Glacier has cleaned and polished the rocks such that the exposures are extremely high quality. There was a separate group of Canadian scientists up there studying the glacier and they told us that the glacier has been retreating since the Little Ice Age (but the rate of retreat has certainly increased in the last century). 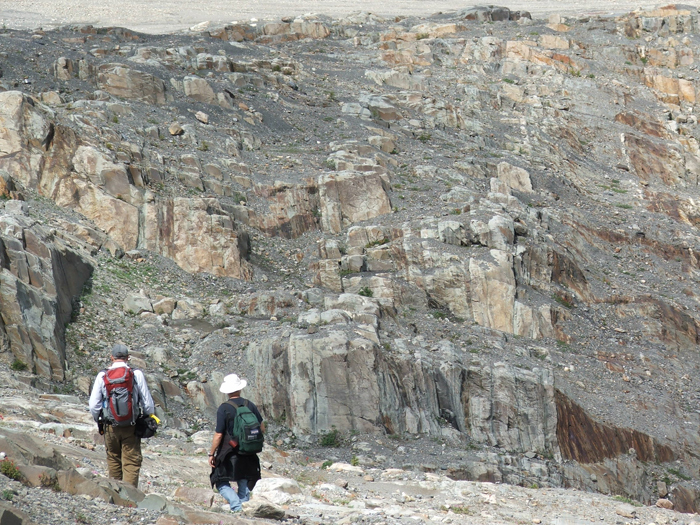 The strata we were looking at are part of the Windermere supergroup, which is a belt of Neoproterozoic rocks in the North American Cordillera that extends from Alaska to the northern United States (and then in localized areas further south). The strata of interest are interpreted to have been deposited along the western passive margin of the paleo-landmass of Laurentia (which is North America essentially) following the breakup of the supercontinent of Rodinia (Pangea is the more famous supercontinent, but is really just the most recent in the Wilson Cycle). From a distance, outcrops of turbidite systems are generally expressed as interbedded mudstone/siltstone and sandstone. Some sections can be mostly sandstone, some can be dominated by mudstone/siltstone, and then everything in between. 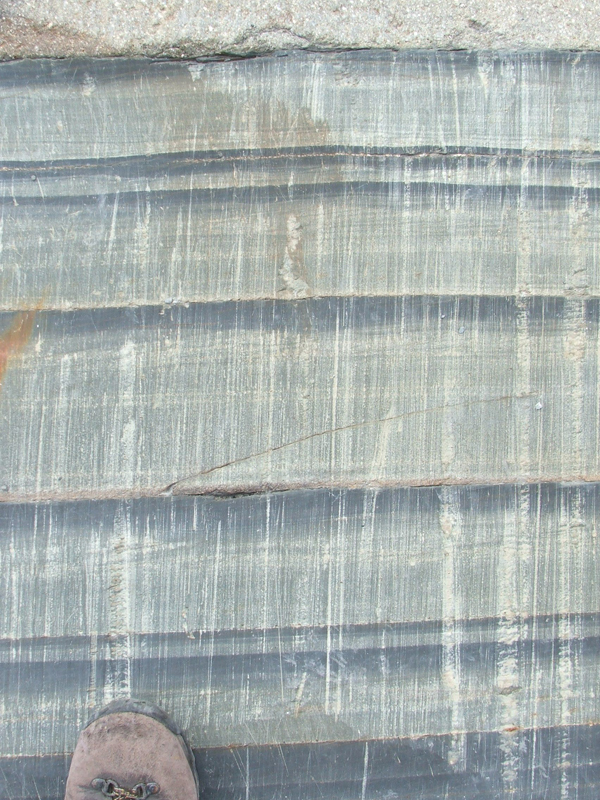 Note in the photo above the coarser-grained and lighter-colored sandstone packages amongst the darker mudstone intervals (stratigraphic ‘up’ is to the left). What is great about this outcrop is the quality of exposure of the fine-grained rocks. Mudstones and siltstones are typically covered by vegetation and/or talus. 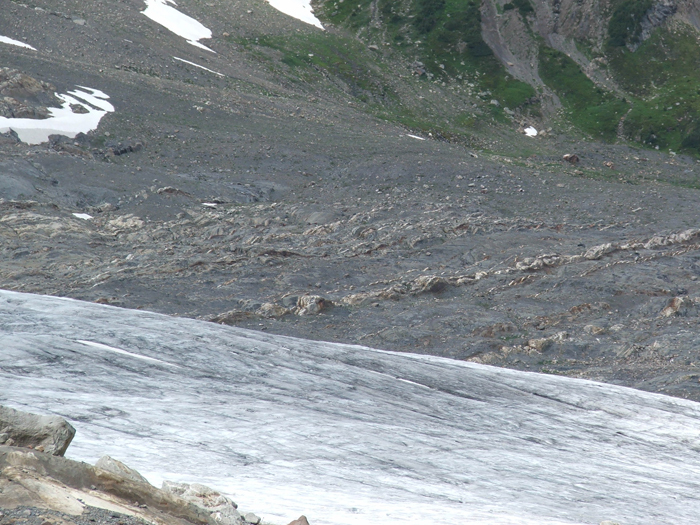 Since these rocks are in the process of being glaciated, the only cover is some patches of glacial debris. The photo above shows a sandier part of the section which is a bit down-section from the previous photo (again, stratigraphic ‘up’ to the left). The cool thing about vertically-dipping strata is that you can examine lateral relationships by simply walking the beds out … and in this outcrop, one can walk out individual beds for 100s of meters. Zooming in a bit more, the photo above (with the toe of my boot for scale) shows some very nice ‘classic’ turbidites. First, you’ll have to look through the prominent vertical streaks (those are the very recent glacial striations). The lighter colors are coarser (fine sandstone) and the darker colors are finer (siltstone). There are several fining-upward beds showing many of the divisions of the ‘Bouma sequence‘, which is the idealized turbidite sequence. Even though these rocks are slightly metamorphosed, the sedimentary structures are beautifully preserved (note the ripple cross-lamination near the top of the middle bed). I have tons more photographs and will be putting together more posts about these rocks over the coming weeks. Schwarz, E. and R.W.C. Arnott, 2007, Anatomy and evolution of a slope channel-complex set (Neoproterozoic Isaac Formation, Windermere Supergroup, Southern Canadian Cordillera): Implications for reservoir characterization. Journal of Sedimentary Research, v. 77, p. 89-109. Ross, G.M. and Arnott, R.W.C, 2008, Regional Geology of the Windermere Supergroup, Southern Canadian Cordillera and Stratigraphic Setting of the Castle Creek Study Area in Nilsen, T., Shew, R., Steffens, G. and Studlick, J., eds., Atlas of Deep-Water Outcrops, AAPG Studies in Geology # 56. Chapter H, CD-Room version. Meyer, L. and Ross, G.M., in press, Channelized Lobe and Sheet Sandstones of the Upper Kaza Group Basin-Floor Turbidite System (Windermere Supergroup), British Columbia, Canada in Nilsen, T., Shew, R., Steffens, G. and Studlick, J., eds., Atlas of Deep-Water Outcrops, AAPG Studies in Geology # 56. Chapter J, CD-Room version. if you’ve never heard of a turbidity current, picture an avalanche of mud, silt, and sand (sometimes pebbles/cobbles) that flows down the continental slope. While big flows are not very frequent over human time scales, they are ubiquitous over geologic time scales. In the last picture, flow was right to left, right? Sedimentary structures and interpretation was my favorite part of strat and sed. What could you say about the very thin sandy layer near the top? I see that occasionally in the OR coast range turbidites (Flournoy Fm); it’s a little disconcerting. Turbidites in my experience are consistent and rhythmic- but then all the sudden there’s this tiny little layer that’s less then a 10th of the thickness of all the surrounding beds. Lockwood … yes, the apparent paleocurrent direction is from left to right in that photo. And this is consistent with the regional reconstruction of landward vs. basinward. As for the rhythmicity (is that a word?) of turbidites … they can seem ordered and rhythmic in some successions, but I’ve seen plenty of other sections where the variability in thickness from bed to bed is quite large. Exactly what controls the thickness of successive stacked deposits in any single location is fascinating and a very active area of research. Two broad types of controls are typically called upon: (1) external controls such as magnitude of intitial flow, how it’s initiated, etc. and (2) self-organizing processes that filter the flows as they travel 10s or even 100s of km downsystem. Love them turbidites! I’m not really sure why – I have never worked in turbidite terrane. Maybe it’s because they remind me of Alaska. I’ll try to get some turbidite photos on my upcoming northern trip. Those, too, have been glaciated in places, although not in the roadcuts I’m likely to visit. 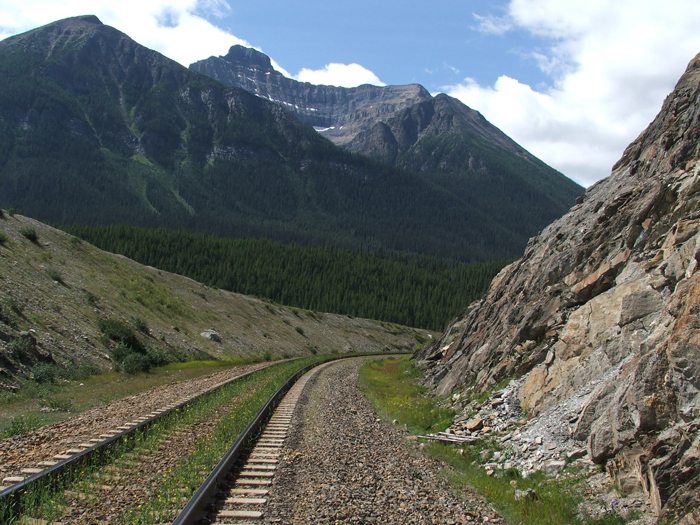 Your railroad-cut photo brings back memories of field trips in undergrad school back east – surprisingly fond memories, it turns out. Hey, very interesting read. Was wondering how long you spent up there and if you may have come across any Brits? We were there from about 7th-25th July, based on the glacier fore field and went up to see the group of students who were there studying the turbidites a couple of times! D. … no, we were up there in the first week of August, but we camped with the student group and their advisor showed us around the outcrops for a couple of days. Beautiful spot!